Drug testing began as a means of making sure people in certain highly dangerous jobs weren’t showing up intoxicated. No one wants the mechanic welding while railing PCP. I feel pretty confident in that. But testing, like so many good ideas, has spiraled out of control. Nowadays up to 62% of all jobs require drug testing in order to be employed. Drug testing is also mandated in certain states in order to receive federal aid. Because apparently poor junkies don’t need to eat…that won’t drive anyone to crime. Drug testing is used to determine whether or not someone is using drugs at any point in the relatively recent past, not whether the drug usage is negatively affecting their ability to perform. I guarantee Josh Gordon didn’t feel like weed had kept him from succeeding before he got suspended for trace amounts. 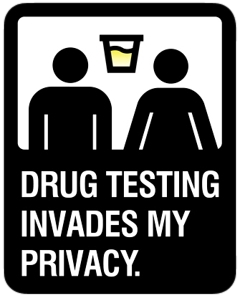 Herein lies the issue behind drug testing: drug tests are designed to invade everyone’s privacy. It should not matter what I do off the clock so long as it doesn’t affect my work. The assumption behind drug testing is that no one can consume drugs and not be adversely affected. Perhaps that is true, but people should be judged based on their performance when they have to perform, not on whether they’re hungover or recovering from ecstasy on their off day. This brings us to the second assumption of drug tests: employers (or schools, or the federal government) have the right to know what their employees are doing on their own time. Drugs take a varying degree of time to clear the system, but all will linger around after a person is demonstrably sober. But drugs are bad and drug users are all bad so the courts and the public have allowed this encroachment on our privacy. One small mercy of drug tests is that they only test for illegal drugs. Except when the substance is illegal in most instances. For example, oxycontin is illegal for the vast majority of the population to possess or use. It is, however, completely, legally okay to take when prescribed. Except that people have been fired for taking prescribed narcotic painkillers. This has happened multiple times and while some of those fired have been able to sue and win in court it is still incredibly damaging to be fired for drug usage. Even if the drug was medically necessary. Another troubling example is that it is still perfectly fine in all but six states to fire someone for medical marijuana usage. Recreational Marijuana is another massive issue. Even in states in which have legalized marijuana for literally every adult there is no law against either testing for or firing someone for consuming marijuana. This is a tad concerning because weed will remain in someones system for weeks on end, significantly longer than any other drug. It is not unfair to say that urine tests distinctly target marijuana users. Companies in Colorado have actually increased drug testing in the past year because of the fear of a stoned workplace. While it is understandable to not want your employees high on the clock their needs to be a better way to attempt to stop it. Impairment tests (similar to concussion tests widely used in football at every level…basically, you get a baseline of how someone performs and then you compare how they’re currently performing, any discrepancy raises concern) offer a potential solution. One day marijuana will be federally legal and that whole sham will end, but until then employees will still suffer for a substance that is becoming less and less criminal at the state level and almost certainly not affecting their performance. Perhaps the states will catch up before then and amend their laws. Until then drug tests will continue to target marijuana users disproportionately because of how long it takes for the drug to clear ones system. A blunt a fortnight ago will not affect performance, and certainly not enough to damage someone’s job, but this is the system we live in. All of this also ignores that urine drug tests are not ironclad, very expensive and rarely turn up results. Even if, for some bizarre reason, you still believe fervently in the war on drugs you have to admit that less than one in twenty tests turning up positive is not a particularly great way to root out drug users. Particularly when false results tend to occur somewhere from 5-10% of all drug tests and tests are far more likely to skew positive than negative. Each test also runs somewhere from 20-60 dollars. Does anyone really believe that the government or a company couldn’t find a better way to spend that money? Drug testing is expensive, invasive and forces drug users who may be perfectly and responsibly consuming their substances to suffer because of the lingering effects of the war on drugs.